My name is Nikki Caudill and I love to teach Horseback Riding to both the new and the "already in love"
I teach riders of all ages and backgrounds, and I especially love being able to bring horses into the lives of people who didn't think it was possible. Teaching gives me more joy than anything else in the world (Except just being around horses of course)! 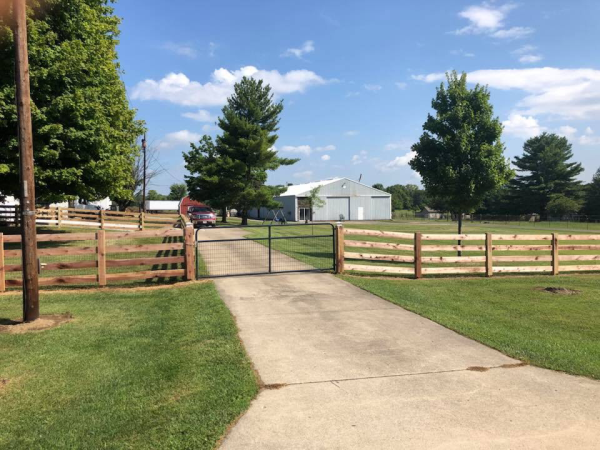 We keep our prices low so that students who wouldn't normally be able to afford to be around horses can make that dream a part of their reality. Other lesson lengths and larger group rates must be discussed with an instructor. Please visit the contact us page. I purchased Profit as a three year old when I was a young rider. He was my personal Eventing partner for close to seven years. But his true calling has always been to be a school horse. Profit does well with beginner riders all the way up to advanced jumping. He has a great personality and loves children. He is especially good at lunging and working with kids and adults alike. 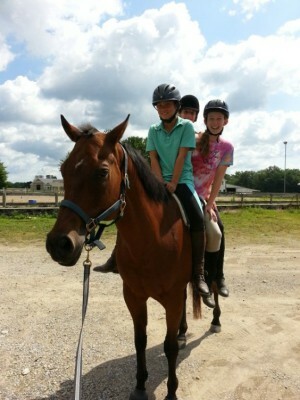 We also use Profit for trail riding and balance training and exercises in Summer Camp. He has a kind disposition and is extremely patient. Profit, sometimes known to the kids as "Bopper", is one of my most popular school horses with new and experienced riders. He especially loves Trail Rides, Jumping, and of course, treats! Profit is currently available for a partial lease to a rider with some experience, please contact Nikki for details. Bowie was one of the first horses that I ever rode, a little over 20 years ago. He is a bit grumpy but a super comfortable ride, patient, and perfect for any beginner. Bowie has a long list of accomplishments including being a show champion in both Dressage and Eventing, earning high marks from nearly every judge he has ever encountered, and teaching many a first time rider how to go through the basics all the way up to show level. Bowie has done everything from Western and English pleasure to barrel racing, trot poles, Dressage, and Trail Riding. As of 2019, Bowie has officially earned his retirement. 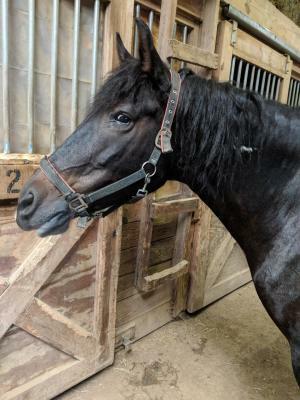 He will continue to greet new riders and teach students how to groom, bathe, and work safely around horses, though he will no longer be giving riding lessons. Bowie still has a forever home with us, so please be sure to give him a pet or a treat the next time you see him. He has taught many riders, including myself, all the basics and helped them along the way. . . he now deserves to be spoiled as rotten as possible! Moose is very popular with the young and intermediate riders. His flashy colors and suitable personallity make him an instant hit. In his younger days, Moose was an Eventer and Dressage Horse, taking multiple wins over his career. As a school horse, he teaches new riders the basics of Dressage and Jumping. His comfortable gaits and easy going nature make him a perfect match for a new or nervous rider, and even though he is older he is still a capable jumper at the lower levels. Moose is currently semi retired and is therefore not available for lease at this time. Goodie is one super expressive little Pony! She has been everywhere, done everything, and loves it all, though her true passion is Jumping. Goodie has shown up to Novice level (2'11" Jumps), and has shown all over the Tri-State area. I reserve her for my intermediate beginners and more advanced riders as she can be a bit on the quick side, especially when it comes to Jumping. She is a blast to ride as well as smooth and comfortable. Last year, Goodie succumbed to a tumor in her left eye and has lost a good deal of her sight in that eye, but it hasn't slowed her down a bit! She still loves to run and Jump her heart out! Goodie is currently available for a partial lease to a rider with a moderate amount of experience, please contact Nikki for details. Dollop of Daisy AKA "Daisy"
Daisy is a little miracle. At only eight years old and with no previous experience as a lesson horse, she quickly became the perfect little pony. She is comfortable, well behaved, patient, and absolutely loves children. With a little jumping in her background, Daisy is ready and willing to try just about anything and she is very eager to please her riders. Daisy is also wonderful for teaching new students how to groom. She is very patient and loves to be brushed. And although some mares can be a bit moody, Daisy is just as sweet and loveable as the flower she is named for when she is with people. She is well on her way to becoming the kids' new favorite! Daisy is currently available for a partial lease to a rider with some experience, please contact Nikki for details. Rusty was recently rescued by "Little Patch of Heaven" Rescue right here in Ohio. He is sweet, affectionate, and willing to try anything we ask him. Pictured here with Profit, he is well on his way to becoming part of the team. Though we don't know if he has ever been a school horse before, Rusty is learning quickly that having many riders means lots of treats! His trot is springy and challenging, but his canter is a dream! We are teaching him the art of jumping, and he is adding new energy and life to our lesson program. As he builds muscle and gains weight, he is quickly becoming a favorite with the students. Rusty is currently available for a partial lease to a rider with some experience, please contact Nikki for details. Bugs comes from a tragic background that we won't discuss here in detail. He was born a wild Mustang on the plains of Colorado and rounded up at about the age of three. Between the ages of three and seven, poor Bugs was not treated well, and ended up being rescued by Kim Kinder and Fighting Chance Rescue in Hammersville, Ohio. So named because he was covered in ticks and parasites, "Bugs" now lives with us at Pony Tails and is fat and happy and healthy. We have been working with him to train him as a school horse for almost two years and he is doing quite well with both beginners and advanced riders, though we have discovered that he can be a little slow at times! He is sweet and friendly, so we don't mind him being a little pokey. Bugs is currently available for a partial or full lease to a rider with a moderate amount of experience, please contact Nikki for details. Welcome Jasmine to the program! 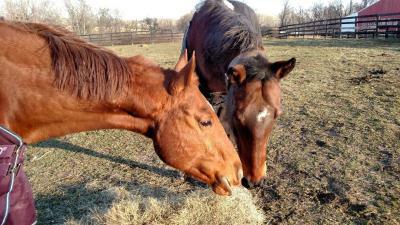 Jasmine is a sweet little mare who has been privately owned since she was rescued 9 years ago by Stephanie Meadows. She has experience with kids, dressage, and jumping, and we are super excited to have her in our program. I will keep everyone posted on Jasmine's progress as we introduce her to the program and get her up to speed and in shape! She has done little for the last three years, so she will need time to acclimate and work up to her potential. As of March 2019 Jasmine is working well into the Program! She is currently being leased by an advanced student and is being ridden about three days a week. She is building muscle and working on her jumping skills, quickly becoming a beloved member of our team. Another rescue from "Little Patch of Heaven", we aren't really sure what Chip's past is or what all he has been through. All we know is that he is little, cute, fuzzy, and a little defensive and grumpy! Little Chip is going to need some serious training in order to become a good school or lead line pony one day, but he is very deserving of our love all the same. At the moment, he is unsure of saddles and girths, though he loves to be brushed and pampered. We are unsure of why he ended up at the rescue, but we know that little ponies have biiiig attitudes, and Chip is no exception! We are also looking into cart training Chip so that we can drive him, as that is a very fun activity for the kids to learn. Chip is not available for lease, but we are always looking for people to help with his training. If you would like to help, please contact Nikki for details. 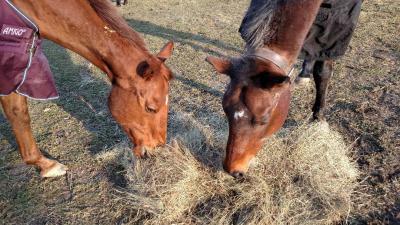 School horse experience: none yet!